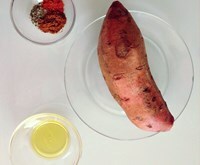 Peel the sweet potato and make very thin cuts alongside the potato but do not cut it all the way through. Mix your spices with olive oil. Spread your oil mixture over the potato and into the cuts..
Bake the potato approximately 50-60 minutes depending on the size of the potato. Let it cool down and enjoy the goodness!